In the world of combat sports, some prizefighters found shelter from troubles in their personal life but only skyrocketed to superstardom the moment they found some kind of father figure. Mike Tyson documentaries credited Cus D’Amato as an instrumental figure in setting his career in boxing. At home, Filipinos loved the narration of Manny Pacquiao himself that he comes from an almost fatherless childhood, had to sleep in the streets at times due to being financially strapped, but found hope in life when sports presented him a chance. Pacquiao showed a lot of promise as a boxer early in his career by repeatedly knocking out his opponents in fights featured in a defunct boxing TV show, Blow by Blow. But such potential was not fully displayed until Freddie Roach came in the picture. Danny “The King” Kingad has some resemblance in this regard. Kingad, now an elite mixed martial artist in ONE Championship who has become one of the top flyweights in the world today, tried sleeping in the streets as Pacquiao did before finally finding his place under the sun by indulging in the combat sport of MMA. “I had lost my way back in my elementary school days” Kingad revealed. “Me and my friends back then would skip school. I dropped out of school twice. I would not come home, and my mother would come looking for me. Sometimes, they would find me sleeping on the streets,” he added. Kingad’s troubles started when he tragically lost his dad at the age of eight. Kingad fell into bad company and was heavily influenced in leading a life that he was not proud of. Without a strong male role model to guide him, Kingad frequently skipped school, and even got involved in selling bootleg merchandise. Then all of a sudden, an unexpected turn for the better took place and, you’ve guess it right, it involved sports. At the beginning of his junior year of high school, Kingad stumbled onto the right path when his cousin and Team Lakay member, Roldan Sangcha-an, introduced him to Wushu. As he excelled in the discipline and dedicated himself to his training, Kingad earned a scholarship to attend the University of the Cordilleras (UC) to compete as part of the school’s varsity Wushu squad. While being a UC Jaguar, Kingad crossed paths with Sangiao, who then handles the college’s wushu program, an incident that would eventually push Kingad’s career into another stratosphere. Under the tutelage of Sangiao, Kingad won a regional Wushu championship in 2015 and built an impressive 29-1 win-loss record in the discipline. With a natural talent in Wushu and his dedication to the art, Kingad got an offer from Sangiao to join Team Lakay, which he admittedly could not refuse. “The great thing about Coach Mark is that he has so much experience, and a lot of stories to share that we all learn from. I have taken that to heart. A lot of the values I live by, I have learned from Coach Mark. He has been a major influence in my life,” he expressed. Kingad continued to develop as a person and a competitive mixed martial artist with Sangiao by his side. “Coach Mark is like a second father to me because he does not just teach me what he knows about martial arts, He also gives me advice in my personal life and how to be a better person” he explained. “He has taught me a lot, and I have learned so much from him – like how to deal with criticism, how to conduct myself in public, to give respect to everybody, and of course, how to live like a true martial artist,” Kingad elaborated further. Kingad has displayed those newfound aspects of his game in his subsequent two victories, including his impressive all-around performance against Chinese prospect Ma Hao Bin last June in Macau, China. As he tries to build some momentum towards a second crack at the ONE Flyweight World Championship, Kingad stressed that his journey to mixed martial arts success would not have been possible without the guidance of one selfless man. The 22-year-old Baguio City native was fortunate enough to have an invaluable mentor and a second father in the person of Team Lakay head coach Mark Sangiao. Sangiao is the headmaster and founder of Team Lakay, which has become an instantly recognizable name in the Philippine mixed martial arts scene because of the big number of successful homegrown talents that it has produced since its inception in 2003. Team Lakay has been recognized as one of Asia’s elite mixed martial arts camps, spawning remarkable Filipino athletes such as Eduard Folayang, Geje Eustaquio, Kevin Belingon, Honorio Banario, Joshua Pacio, April Osenio, Gina Iniong, and of course, Kingad. 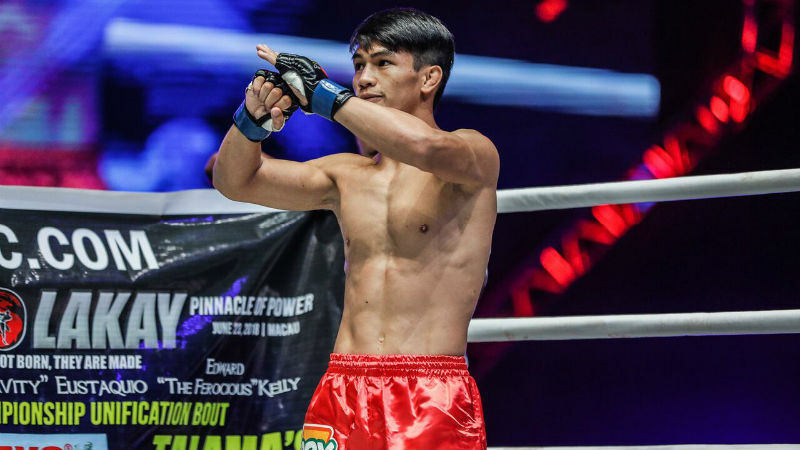 Kingad and Sangiao have a close relationship as it was the mixed martial arts trainer who gave the young Filipino a much-needed direction at a time in his life when it was heading off the rails. Kingad is slated to return to action on September 22 as he faces Japanese newcomer Yuya Wakamatsu on the undercard of ONE: CONQUEST OF HEROES, which takes place at the Jakarta Convention Center in Indonesia. Having Sangiao sitting on the coach’s stool to give him instructions in the heat of the action, Kingad is confident that he could pull off a decisive victory in his next assignment on the ONE Championship stage. “My victories are his victories. At Team Lakay, we learn from each other through our shared experiences. It is one of the best things about our little family. With Coach Mark by my side, I am confident that I will be able to ace my upcoming test,” he ended.